Mindless Mirth: Cool Music Friday # 17 - Frente! Frente! are an Australian alternative rock group, formed in 1991. 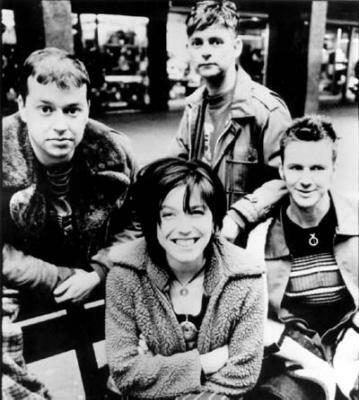 The original lineup featured singerAngie Hart, founder and guitarist Simon Austin, bassist Tim O'Connor (later replaced by Bill McDonald), and drummer Mark Picton (later replaced by Alastair Barden). Frente! 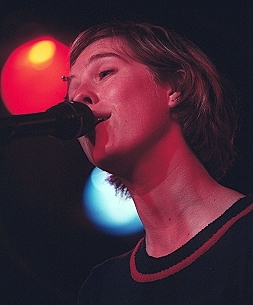 burst onto the Australian music charts with the singles "Ordinary Angels" (from the Clunk EP, #3, gold) and "Accidently Kelly Street" (#4, platinum) in 1992. Notable as much for the bizarre film clips ("Accidently Kelly Street" consisted of the band with oversized novelty props of household items, and the title of the song was purposely written with an initial lowercase) as their light-hearted pop lyrics, Frente! 's debut album, Marvin the Album (#5) was also a success, going platinum in Australia. Another single was released from the album in early 1993, "No Time" (#50), which did not fare as well. "Ordinary Angels" finished the year as the 20th best selling single of 1992 on the ARIA charts, with "Accidently Kelly Street" finishing 29th. The band promoted overseas in 1994 with their biggest success being an acoustic cover version ofNew Order's "Bizarre Love Triangle" which reached #76 in the UK (following releases of earlier tracks "Ordinary Angels" which did not chart and "Accidently Kelly Street" which reached #84). "Bizarre Love Triangle" was released in Australia on a re-issued version of the "Lonely" EP in 1994 (#7, with the first issue charting at #88). The cover was also a hit in the United States, charting at #10 on theModern Rock Tracks chart and #49 on the Billboard Hot 100. The band's only other chart placement in the US was a re-release of the "Labour of Love" single, which managed #9 on the Modern Rock Tracks chart. In between the first and second Frente! albums, Angie Hart lent her vocal to an Australian single byPop! titled "Tingly" (#92), released in late 1995. Frente! released a second album, Shape, in 1996. The first single "Sit On My Hands" peaked at #66 in Australia, and the second, "What's Come Over Me" did not enter the top 100 although it did reach #83 in the UK. The album peaked at #35. Frente! broke up shortly after its release to pursue other projects. Frente! also has a track on the compilation album Saturday Morning, a cover version of "Open Up Your Heart (and Let the Sunshine In)". The album was released on 5 December 1995. Frente! also appeared on the soundtrack for the hit American TV show: Melrose Place with the song "Ordinary Angels". This album was released 18 October 1994. Frente! disbanded in 1996, and Angie Hart moved on to the pop duo Splendid, and later to the band Holidays on Ice (with Dean Manning and Naomi Radom). 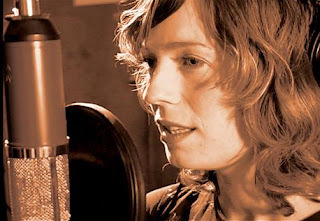 Her debut solo album was released in 2007. In January 2005, Frente! reformed for some Australian east coast dates. The line-up for these shows was Angie Hart, Simon Austin and Bill McDonald with Pete Luscombe on drums. In 2010, Frente! 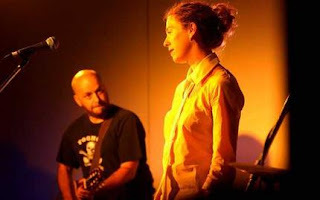 played at a Punters Club reunion show at the Corner Hotel, curated by Angie Hart. Although Frente! as a band is gone, Angie Hart's Music Lives On! Her newest solo CD titled "Eat My Shadow" is GREAT!